Firewatch is a game about watching for fires in the great forests of Wyoming, which doesn't sound like much to build a game on. The reveal trailer from 2014 makes clear that there's a whole lot more going on than just staring at swaths of trees from atop a wooden tower, however, and while the journey from good teaser to good game is always filled with peril, I am hopeful that it will up to its billing when it comes out. Which, by the way, will happen on February 9 of 2016. "Right now we’re still polishing, optimizing, writing, and developing the last bits of the game, but we can’t wait to put it out there for you to play," developer Campo Santo announced today. "Our goal is a worldwide simultaneous release!" The studio said it will reveal more about the game as the release date nears, and also teased "some opportunities for folks to get an early hands-on." 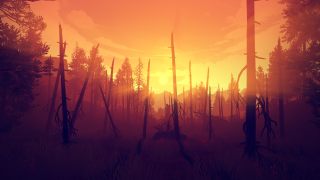 Campo Santo tossed out a few lovely new screens too. Give them a look below. And speaking of hands-on, don't miss ours from earlier this year.